In corporation with our associate company UV Technology (The UK’s leading provider of UV-C Disinfection); Asmech Systems are delighted to design and manufacture UV-C Tunnels, Conveyors and associated equipment. Working with Asmech Systems, UV Technology Limited are at the forefront of the development of bespoke UV-C decontamination tunnels. Driven by a growing demand for higher quality standards, food processors can now benefit from UV-C disinfection technology, helping them realise higher standards with reduced dependence on chemical processes. UV-C Product decontamination technology is approved by the Food Standards Agency, The Food and Drug Administration (USA), The Soil Association (Organic Lobby). Furthermore, there are no specific labelling requirements with respect to UV-C product decontamination. 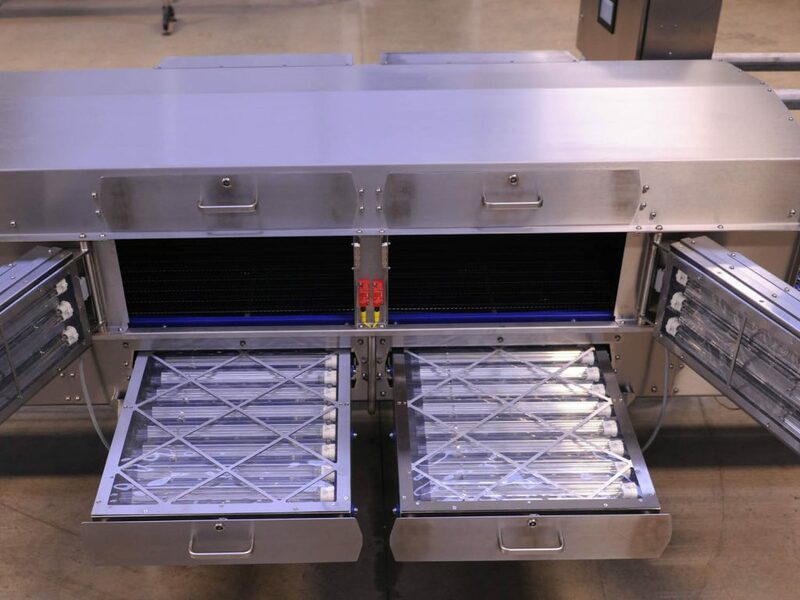 The UV-C Decontamination conveyors and tunnels are manufactured from Grade 304 stainless steel and designed with hygiene in mind. They have upper, lower and side cassettes and an open pitch stainless steel belt. All parts except the cassettes are suitable for wash down and everything is designed with hygiene in mind. Complete with an IP65 Control panel to operate the machine and a separate IP54 Electrical panel to house the ballasts. UV Decontamination is regularly used in the Food Industry, Health Care Industry, Facilities Management and HVAC/Refrigeration.